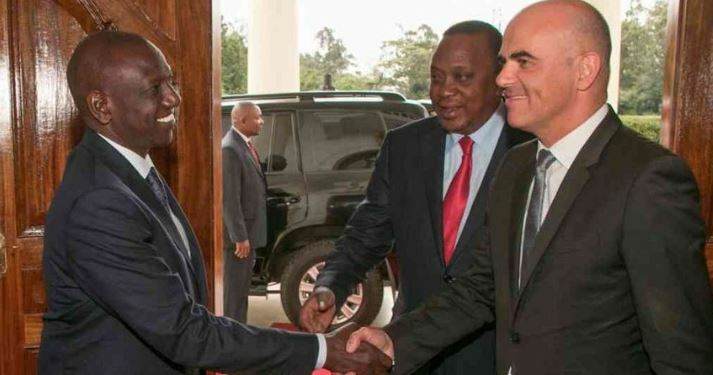 President Uhuru Kenyatta and his Swiss counterpart Alain Berset on Monday oversaw the signing of a key agreement that clears the way for the recovery of assets acquired through corruption and crime in Kenya and stashed in foreign countries. The two heads of state said the agreement, Framework for the Return of Assets from Corruption and Crime in Kenya (FRACCK), which is also supported by the United Kingdom and the Jersey Island, will create a mechanism for Kenya to recover money stolen by corrupt individuals and hidden in the three countries- Switzerland, the United Kingdom and Jersey Island. President Kenyatta said the signing of the agreement at State House, Nairobi, was part of his resolve to eliminate corruption in the country, saying that his stand on the vice is clear. “We have seen, in the last few months, a new intensity in the fight against corruption in Kenya. Quite frankly, my administration has shown that corruption cannot and will not be tolerated,” said the President. The framework, which is in line with the United Nations Convention against Corruption, provides the principles to guide the recovery of stolen assets. The first assets to be targeted by the new framework will be monies stolen through the Anglo-Leasing scandal and hidden in Switzerland. “In the spirit of the Global Forum on Asset Recovery’s Principles for Disposition and Transfer of Confiscated Stolen Assets in Corruption Cases, returns should proceed in a transparent and accountable manner with the mutual consent of both Kenya and the partner offering the return,” says the new agreement. To avoid complicating of asset recovery, the framework says that recovery should follow executable judgements. The agreement further says that assets recovered under the mechanism will be used to pursue clearly identified development objectives, for example in the health sector, that benefit the people of Kenya in line with the Agenda for Sustainable Development and Vision 2030. A steering committee comprising of the Executive Office of the President, the Attorney General, the National Treasury, the Assets Recovery Agency, Ethics and Anti-Corruption Agency and envoys or representatives representing the partner countries will be established to implement the deal. Parts of the roles of the team will be identifying potential assets to be recovered; identifying potential implementing organisations; decide unanimously on priorities for the use of returned funds; monitor progress in returning assets; receive reports on the progress of projects funded through recovered assets and learning lessons for future returns. The agreement also has a provision to allow other nations willing to cooperate with Kenya in the recovery of stolen assets to join. “Other countries that have anti-corruption laws and that have identified proceeds of corruption that they are willing to return to Kenya may join as new partners with the consent of all the existing partners and the government of Kenya. Speaking after the signing of the agreement, President Kenyatta who was joined by Deputy President William Ruto and other senior Government officials, said the fight against graft will continue. “The reasons could not be clearer. Corruption directly threatens Kenya’s future; it denies our children the education they deserve; it denies Kenyans the public goods their hard work has earned them, and it degrades the quality of our Government. Most unfortunately, it erodes Kenyans’ pride and confidence in their country,” said President Kenyatta. President Kenyatta thanked President Berset for Switzerland’s continued support of Kenya’s prosperity saying that Switzerland which was the first country to recognise Kenya at independence in 1963, has given immense support to Kenya’s health and humanitarian sectors. “Our friendship with the people of the Swiss Confederation endures. Our friendship dates back to our independence, and has grown stronger in the half century since,” said President Kenyatta. He said the two countries are working on an agreement to tackle double taxation while also inviting his guest to attend the global blue economy conference Kenya will co-host with Canada later in November this year. President Kenyatta also announced that Kenya will open a new embassy in Switzerland by October to promote trade and tourism. President Berset who is in the country for a two-day official visit said his country appreciates the role Kenya is playing at a regional and global stage. The Swiss President further said that Kenya is a good investment destination and that opportunities for more trade are opening up under President Kenyatta’s Big Four development agenda. Earlier, the two leaders held private talks followed by a bilateral meeting where they discussed how to deepen trade and security ties between the two countries.